Last weekend I had a memorable Thai dinner at Nahm (The only Thai restaurant that was awarded the World’s 50 Best Restaurants), I read his interview and learned that he got his ingredients from Bangkok’s Or Tor Kor market near the famous Chatuchak weekend market. I have been to Chatuchak hundreds of time, but I have never made my way to Or Tor Kor. Big mistake! so today after my yoga class, I went straight for the market tour. Or Tor Kor Market (ตลาด อตก. Marketing Organization for Farmers) is ranked as one of the 10 world’s best fresh markets by CNNGo. 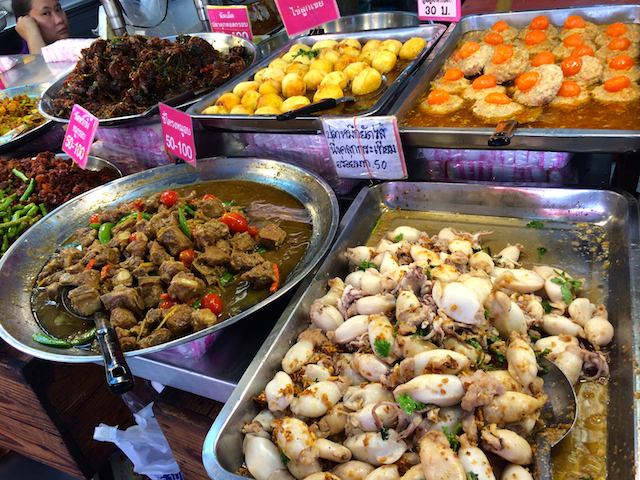 It has some of Bangkok’s best produce, no matter what the season. Products displayed here are selected among the best found in the entire country. 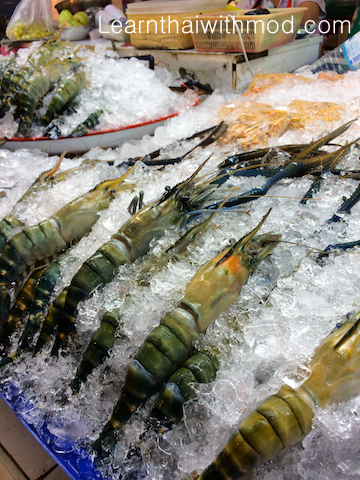 There is an incredible range of beautiful fruits, extremely fresh vegetables, meats and seafood. There is a saying in Thai “กองทัพต้องเดินด้วยท้อง /gawng táp dtâwng dern dûai táwng/” (An army marches on its stomach), I had to get a bite to eat first. My friend recommended me to have lunch at a place called สุดใจไก่ย่าง Sut Jai Gai Yang where they offer excellent Northeastern Thai food. I ordered half of a grilled chicken and a plate of Som Tam ส้มตำ (Shredded green papaya, tomatoes, hot red chillies salad). 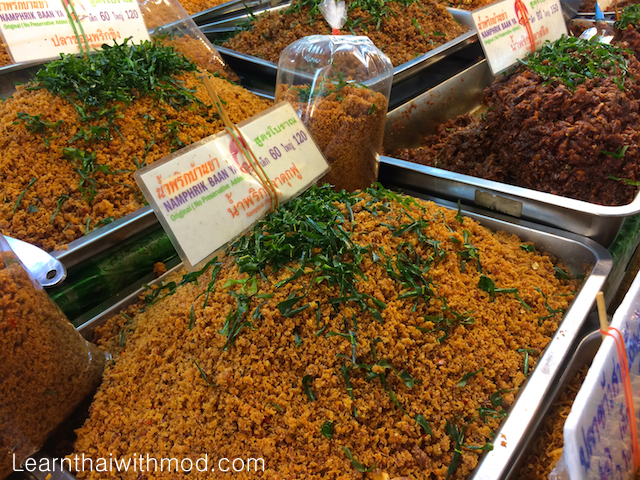 They are Thailand’s first Som Tam Champion and they have been serving Som Tam for more than a decade. I was not disappointed. 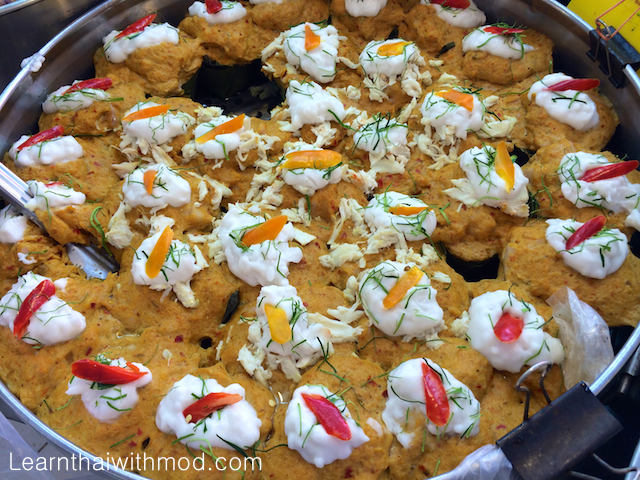 If you like Isan food, don’t miss this place. 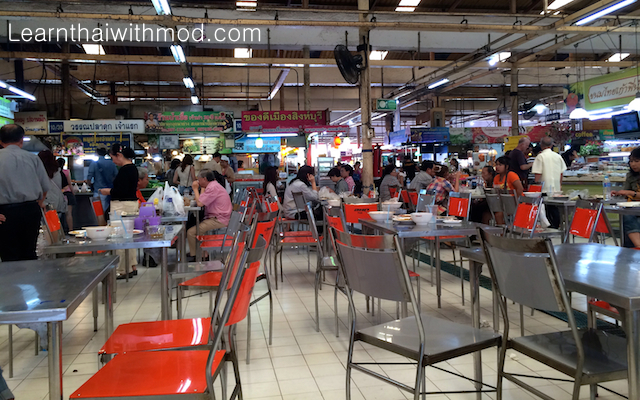 On the right side of the market is a nice food court. 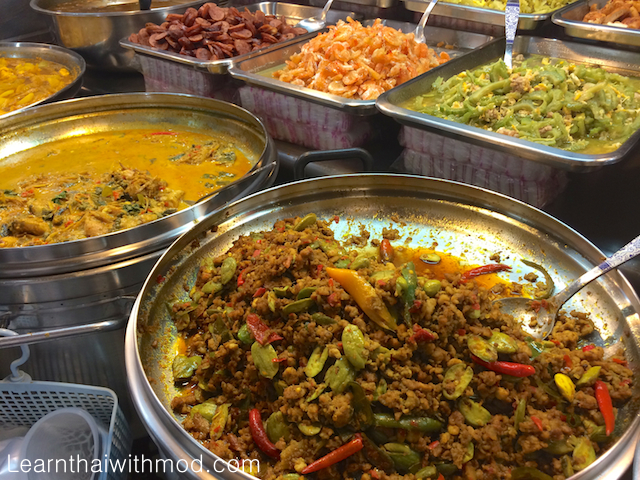 My eyes and nose were instantaneously attracted to an impressive selection of curries and cooked dishes. 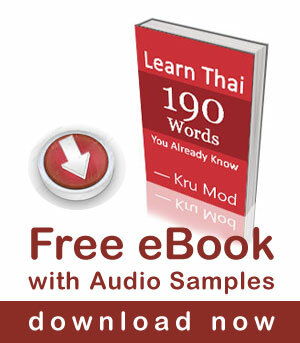 (In Thai is called ข้าวราดแกง kâao râat gang). 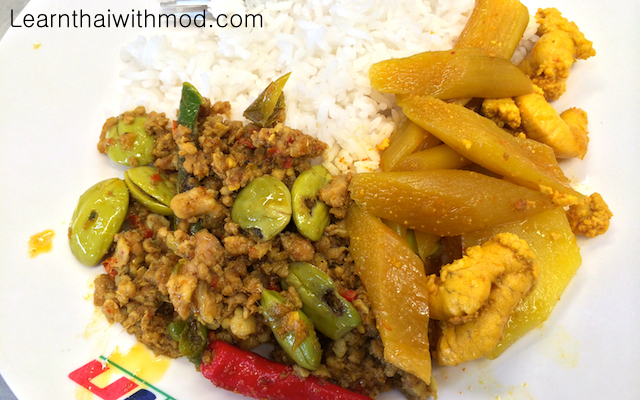 I ordered my favourite Southern Thai dish called ผัดสะตอ Pat Sa Taw (stir-fried stink bean) and แกงส้มไข่ปลา Gang Som Khai Pla (orange curry with fish eggs) . It absolutely hit the spot! so delicious!! 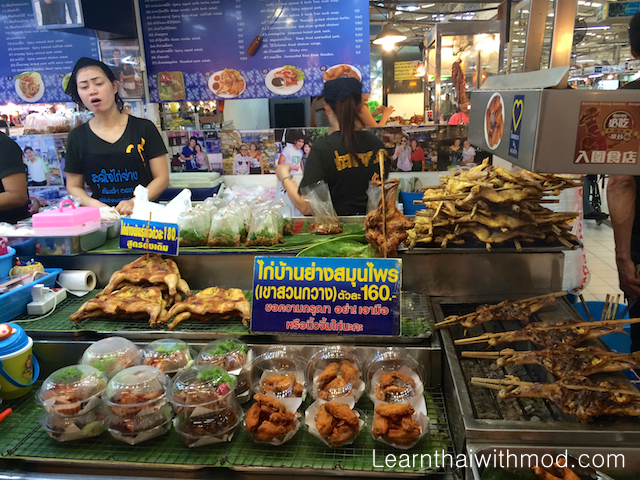 Next to the food court area, there are a few Thai dessert stalls. I have a sweet tooth so I bought a box of these little colourful cute cups called ขนมน้ำดอกไม้ Ka Nom Nam Dok Mai (Jasmine Scented Thai Sweets). 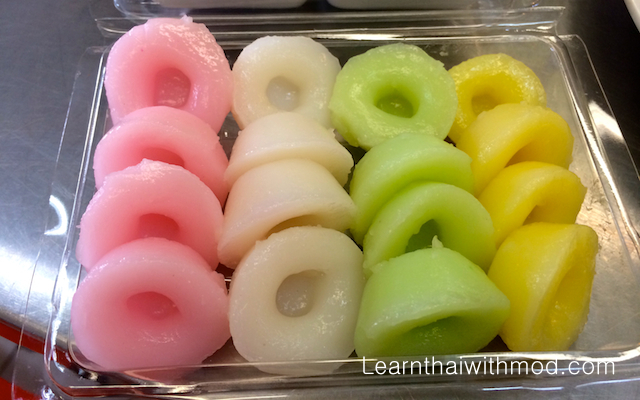 My mom used to make these when I was a little girl, it is one of my favourite Thai desserts. 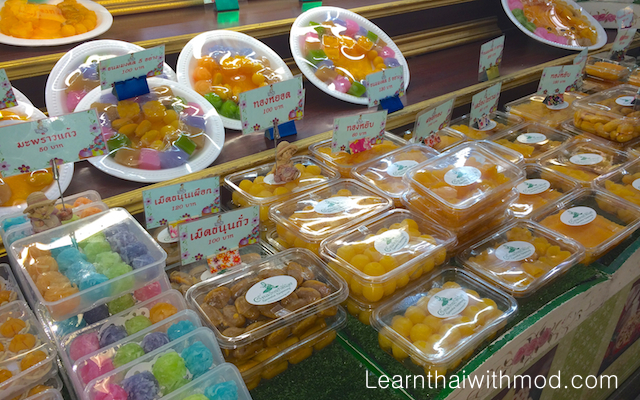 There are many selections of traditional Thai desserts including 9 Auspicious Thai desserts. With My stomach filled, I was ready to tour the market and shop some food for my kitchen. 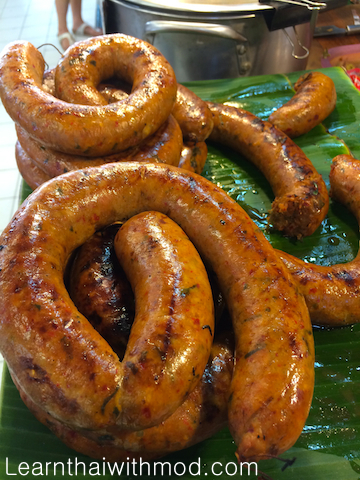 I passed a stall selling ไส้อั่ว Sai Ua, curled up Northern style fermented sausage made with curry taste, redolent in kaffir lime and lemongrass. This is best with a slice of ginger. 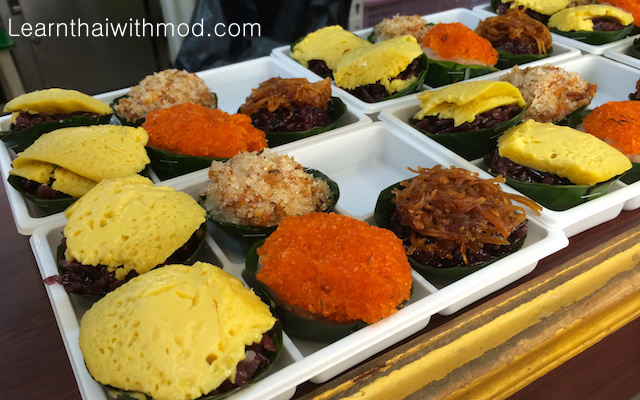 I bought one for home, it was very good, but the best Sai Ua I ever had is in Chiang Mai. The next section is full of cooked dishes and dozens of pots full of curries that the sellers only sell for take away. Variations of Nam Prik (น้ำพริก náam prík) Thai chili dipping sauce , the most common everyday foods in Thai cuisine. 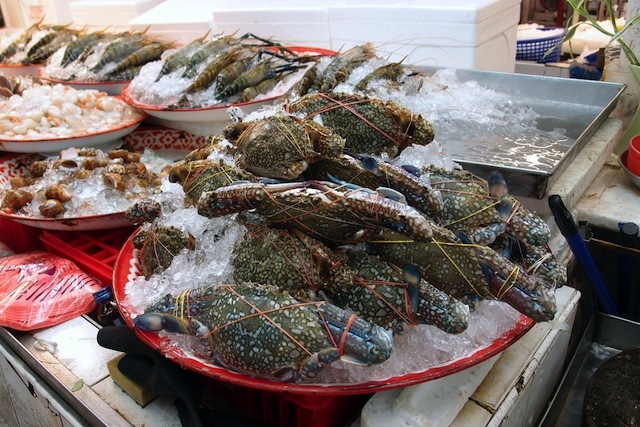 It is normally eaten as a condiment or dipping sauce for fried fish and lots of boiled vegetables. 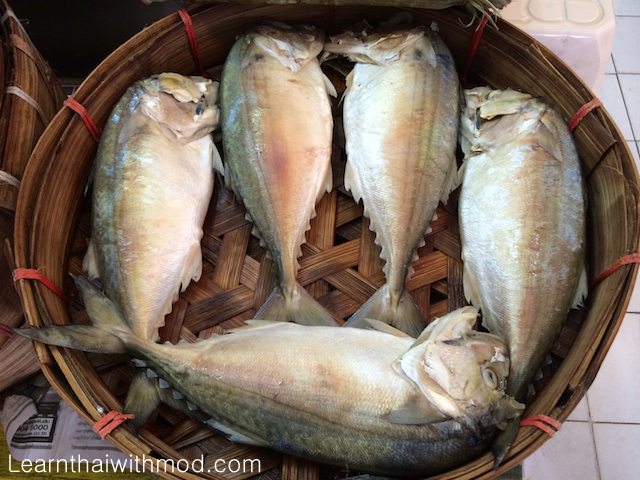 The biggest ปลาทูนึ่ง/bplaa tuu nûeng/ Steamed Short Mackerel I have ever seen! On the way to the food court, I had my eyes on some golden durians so I headed to the fruit section. 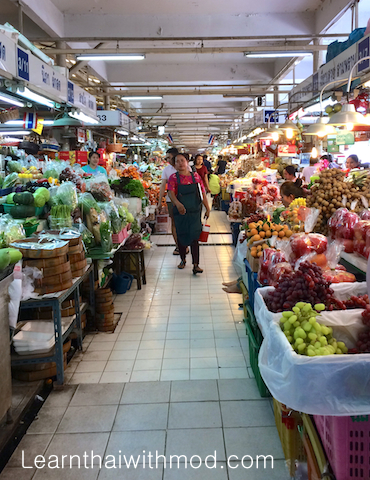 Or Tor Kor has Bangkok’s highest-quality fruit. Look at these gorgeous golden durians! 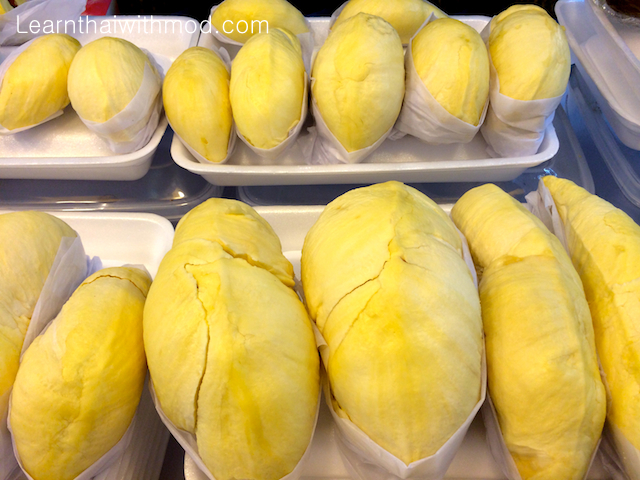 The normal Durian season in Thailand is from April through August, but highest quality of durian is available year round here. 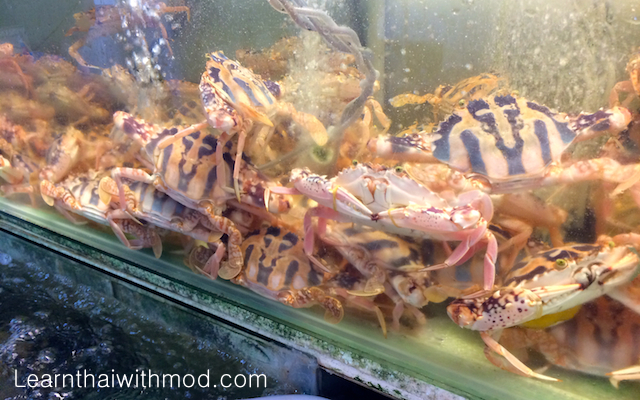 The price is very expensive if you buy it off the season (140 Baht for 100 grams). I stopped at one of many durian stalls. The female seller was very eager to let me try ทุเรียนก้านยาว Durian Kanyao, or the long stem durian, which is normally the most expensive and high class durian to eat in Bangkok. (If you have a chance to eat kanyao, take it!). The flesh is very sweet, incredibly creamy and even when overripe it doesn’t become too mushy. I ordered two pieces without asking for the price first, she wrapped it nicely in to a beautiful package and handed to me then said “600 Baht”. I was shocked! 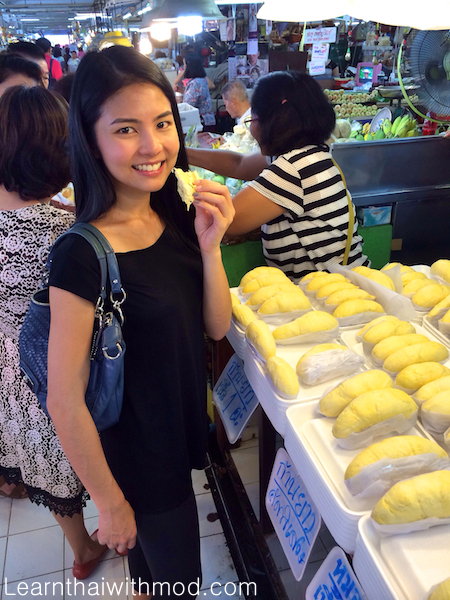 Usually during the durian season durian costs about About 80 – 150 THB per kilo. I bought it anyway because I was craving for it so much. I was like a kid in a candy shop in this market. 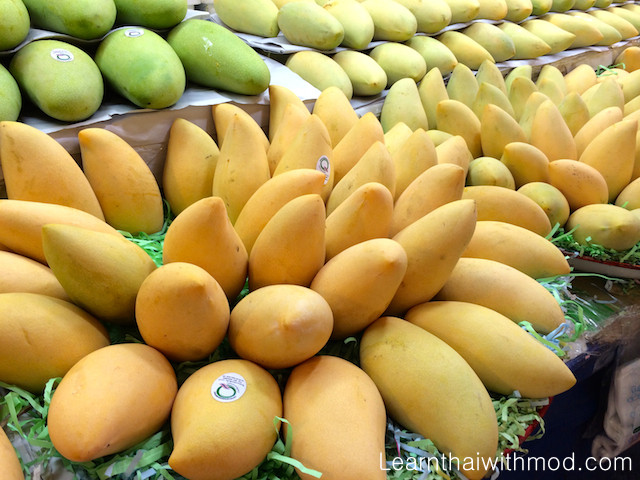 There is an incredible range of beautiful fruit here, you will find such as toddler-sized mangoes. I then went to survey the fresh vegetable and seafood section. 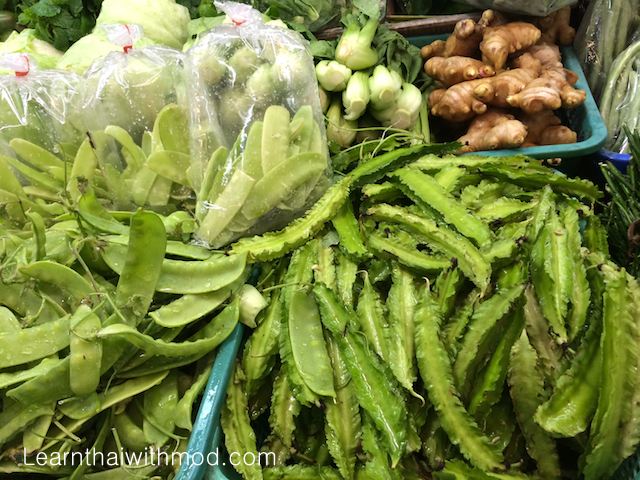 I love these Thai Winged Beans, they are very good in ยำถั่วพลู Yam Tua Plu (Winged Bean Spicy Salad with Shrimps). Tip:I was going to take MRT (underground train) back home, but I was stopped by a security guard at the station’s entrance. He said durian was not allowed on board. I had no idea about this before, so I had to walk back to the road and take a taxi. How to get there: You can catch a taxi or sky train out there, but the underground train is probably the easiest. 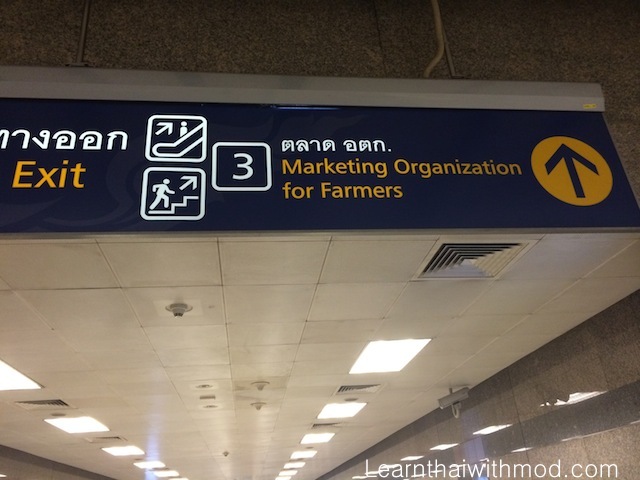 Take the MRT subway to Kamphaeng Phet station. Exit number three, and you’re in the market. Wow, I am drooling upon seeing the durian and mango. 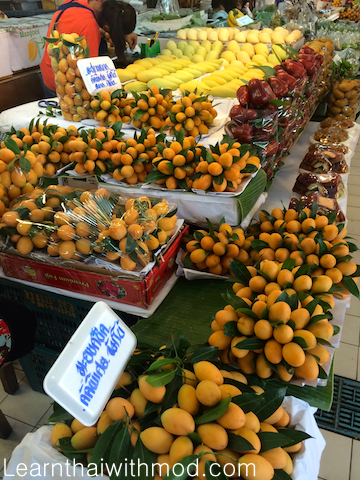 I love the fruits in Thailand. Thanks so much for the information. This market will be in my list in this Nov. Thanks. Thank you for your comment Andrew. I am happy to hear that you found my post useful. Have a great time in Thailand! Near Chatuchak? Is it open only at weekend, or open everyday? Interesting Articles of legitimately fascinating information. definitely on my list in my April visit to Thailand. 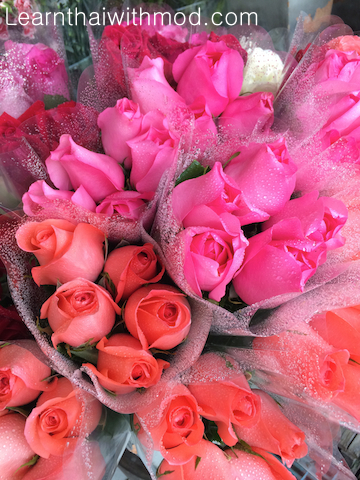 sawardee krap khun narak sway mak i whas on Chatuchak very nice market you can buy everything there the park near is also nice i miss bangkok …. really nice article, thank you. Lots of useful info & tips. 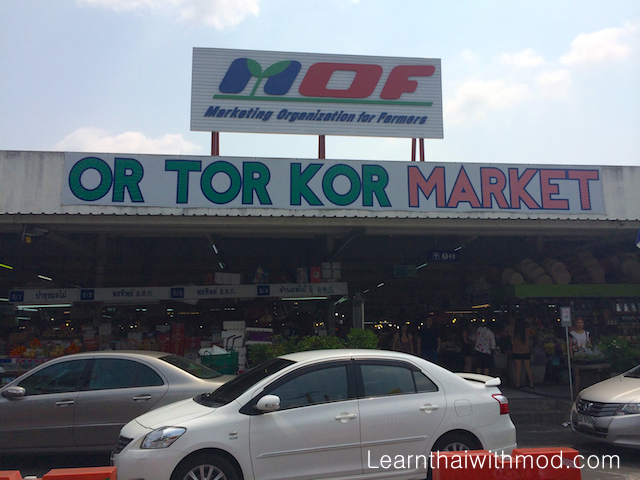 I am in Bangkok & will visit the Or Tor Kor Market.